Does the [New York] Police Department Profile? Should It? Does the New York Police Department profile for potential terrorists - does it stop, arrest, search, or otherwise investigate a person on the assumption that his racial or ethnic identity makes him more likely to commit a certain type of crime? The NYPD, like every Western law enforcement agency, indignantly denies profiling. Its spokesman, Paul Browne, said in August, "Racial profiling is illegal, of doubtful effectiveness, and against department policy." But it does, in fact, profile. For proof, note evidence produced in the trial of Shahawar Matin Siraj, a 23-year-old illegal Pakistani immigrant, convicted on May 24 of planning to blow up the Herald Square subway station in New York City. The NYPD knew about his hatred for America and his predilection for violence only because it had monitored city mosques intensively. A 50-year-old Egyptian immigrant, Osama Eldawoody, a paid police informant and the central witness against Siraj, said under cross-examination that he had rooted about mosques in Brooklyn and Staten Island, making about 575 visits during 13 months in 2003-04. His instructions, he testified, were to keep "his eyes and ears open for any radical thing." The detective running him, Stephen Andrews, confirmed under oath how Mr. Eldawoody "was supposed to be on the lookout for whatever was going on. His eyes and ears were to be open." Likewise, an undercover Muslim NYPD detective of Bangladeshi origins, known pseudonymously as "Kamil Pasha," testified in the Siraj case about having been sent to Bay Ridge, Brooklyn, to be a "walking camera" among Muslims living there, to "observe, be the ears and eyes." Significantly, the NYPD has no comparable program to surveil cathedrals, churches, chapels, synagogues, or the religious buildings of Hindus, Buddhists, Jains, Shintoists, animists, or anyone else. Profiling worked brilliantly in this instance; Kamil Pasha had contact with Siraj 72 times. As a result, Joseph Goldstein wrote in The New York Sun, "Before police knew of a plot, the department already possessed detailed reports of Siraj's political views and his often violent and inflammatory statements, which recorded his satisfaction at the loss of the space shuttle Columbia and his support for Osama bin Laden." Even after this information came out, Mr. Browne argued that his department "does not engage in profiling." [When law enforcement lies, as it constantly does about profiling, public trust erodes.] Profiling is an obviously useful tool, so the solution lies in passing laws to permit the police to do so overtly and legally. On the very day of Siraj's conviction, an intrepid Democratic assemblyman from Brooklyn, Dov Hikind, proposed such a law in the New York State Assembly. Bill A11536 would authorize law enforcement personnel "to consider race and ethnicity as one of many factors which could be used in identifying persons who can be initially stopped, questioned, frisked and/or searched." In a clever act of political jujitsu, Mr. Hikind noted that in Grutter v. Bollinger, a major case concerning affirmative action in college admissions, the U.S. Supreme Court permitted making governmental decisions on the basis of race and ethnicity on two conditions: that doing so serves a "compelling governmental interest" and that these are not the only factors used in reaching decisions. Mr. Hikind told the BBC that preventing terrorist attacks "is an even more compelling governmental interest" than education, making it therefore acceptable to factor race and ethnicity into what he called "terrorist profiling." A former New York City police commissioner, Howard Safir, the columnist Clarence Page, and the American-Arab Anti-Discrimination Committee all have written or said that they agree with Mr. Hikind. So do I, but with a caveat: While permitting racial and ethnic externals to be factored into snap decisions is a clear common-sense imperative, the ultimate goal is to know a person's world view. As I put it in 2004, "Islamism … prompts Islamist terrorism, not speaking Arabic." For now, however, the Hikind bill does a great public service by establishing the legitimacy of profiling. It urgently needs to be passed. Sep. 25, 2006 update: I follow the activitie of the star detective at "Kamil Pasha, NYPD's Undercover Agent to the Islamists." Apr. 3, 2008 update: For another example of the police profiling, see Erica Blake, "'The Trainer' begins terror trial testimony: U.S. informant describes making contacts," Toledo Blade. 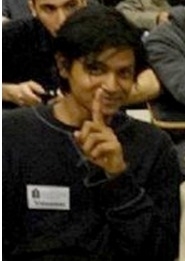 Feb. 25, 2009 update: A parallel instance of investigating mosques has been announced in Los Angeles with the arrest of Ahmadullah Sais Niazi, 34. For one account, see "Bail Set for Man Arrested by Terrorism Task Force." 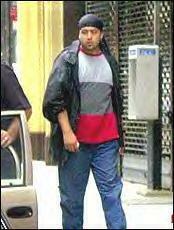 Shamiur Rahman, alleged former NYPC informant. has now denounced his work as an informant, said police told him to embrace a strategy called "create and capture." He said it involved creating a conversation about jihad or terrorism, then capturing the response to send to the NYPD. For his work, he earned as much as $1,000 a month and goodwill from the police after a string of minor marijuana arrests. … Rahman said he received little training and spied on "everything and anyone." He took pictures inside the many mosques he visited and eavesdropped on imams. Related Topics: Counter-terrorism, Muslims in the United States, Radical Islam | Daniel Pipes receive the latest by email: subscribe to the free mef mailing list This text may be reposted or forwarded so long as it is presented as an integral whole with complete and accurate information provided about its author, date, place of publication, and original URL.